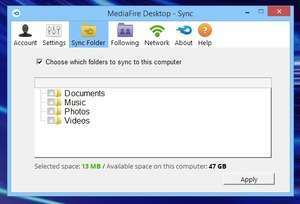 MediaFire Desktop is the PC counterpart to the online filesharing service MediaFire, if the name wasn't obvious enough. With this application, you can synchronize your files and folders with the cloud, making them available anywhere with an Internet connection. You can also follow friends, colleagues and others. Notifications pop up in the system tray letting you know of any activity updates. Version 1.9.11.11059 is a freeware program which does not have restrictions and it's free so it doesn't cost anything. For security reasons, you should also check out the MediaFire Desktop download at LO4D.com which includes virus and malware tests. Additional screenshots of this application download may be available, too.